Hildy Biddle is her high school newspaper's star reporter. She believes strongly in the power of the press, in finding the heart of the story and in Truth-with-a-capital-T. When the town's local newspaper starts a campaign of fear about the the local haunted house, Hildy and the other staff members of The Core are determined to find the facts and bring Truth back to Banesville, New York. First off, as I mentioned the other day, I'm a sucker for stories about idealistic young journalists. I remember being totally jealous of Harriet M. Welsch's stint as editor of her class paper, and I know there was another book I read as a kid that involved a mimeograph machine*. 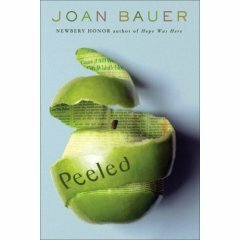 Add that to my love of Joan Bauer, and yeah -- I was certainly predisposed to like Peeled. It's like many of her other books, in that it features a strong heroine who's very interested (and very good at) something specific and gets involved with a situation where she uncovers corruption. In Hope Was Here, it was waitressing and town politics; in Rules of the Road, it was shoe sales and business ugliness; in Peeled, it is journalism and, er, corrupt journalism. Though it's set in high school, I can't think of any reason why I wouldn't hand it to a younger reader. I did feel that the first half of the book was strong than the second half -- the introduction of the characters and the situation had me very excited and involved with the story, but once I realized that everything really was going to go exactly the way I expected, I liked the book less. It was like driving along a straight, flat stretch of road with a destination in sight -- not unpleasant by any means, but no curves and no surprises. The introduction of Zack, the love interest, was absolutely fantastic, but after that he had a couple of "Let me TEACH you about SCIENCE**" moments, and sadly, I never felt that Braverman swoon. It isn't her best book, but it's still a comforting read, and I do think her fans will enjoy it -- I know that the Middle School Me wouldn't have been nearly as critical, and in fact, probably would have loved it. I imagine (and hope!) that there'll be some young readers who'll be inspired by Hildy's doggedness, idealism and integrity, who will get involved with their own school (or, heck, local) newspapers, who will start to look at the information they're given with a more critical eye, and who will realize that isn't an age limit on making a difference in their world. *Maybe at a summer camp? Anyone? What was that? **Speaking of, we were watching an episode of Numb3rs last night (from Season Two) and I almost FAINTED when Bill Nye showed up. I really wanted him to be the bad guy, but sadly, he wasn't. Regardless, it was awesome. The Best Tom Swifty in the World!